Authentic leadership leads from the back and only as an exception comes to the front. Your next level of awareness leadership operation after self-charismatic-leadership is self-servant-leadership. 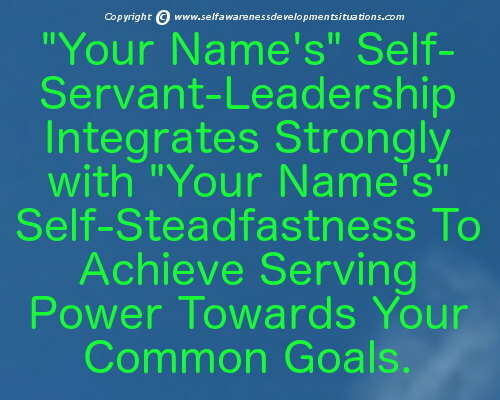 Use self-servant-leadership to develop in you a strong tendency to require you to be aware of, engage to, based in, oriented to or by and driven on self-steadfastness in order to produce your best servanthood results. In the progress of your leadership integrated enlightenment you will move to your self-servant-leadership awareness in an evolutionary way as you follow your true north. This is why you need self-steadfastness so that it will wrap you inside self-servant-leadership in a sustainable way. When you become aware of engaged to based in oriented by and driven in steadfastness you are clothed with the right armour to exercise your self-servant-leadership as the predominant leadership amongst other leadership styles. Steadfastness becomes the awareness, regulating and developing girdle of your self-servant-leadership as you pour your own servanthood to your-self, firstly, in order to be in a position to serve others around you. As a uniquely driven leader you pursue self-servant-leadership wrapped in steadfastness for servanthood self-enlighting, self-regulating and self-developing processes, things, and phenomena. This kind of self-leadership does not remove but compliments your other types of leadership - authentic, transformational and charismatic leadership. Pursue servanthood within your authentic, transforming and charismatic context and not outside. Otherwise you risk isolating crucial self-leadership styles to compliment one another and create a balanced leader inside you. That is why your face, for example, has what you would call forehead leadership, eyes leadership, nose leadership, mouth leadership, cheeks leadership, chin leadership all subordinated to your mind as the key leader and participating proportionately to express your-emotions and countenance. You stay inside your self-steadfastness by your serving power of self-servant-leadership. Your self- servant-leadership applies the AEBOD acronym (see the video on AEBOD in your course on Self-Leadership By Your Own Precision Words for Beginner's at Udemy to get an explanation of the acronym) to drive self-steadfastness through your personal qualities creatively selected by your mind provoked by your verbalizations from the PQ Chart (see the video on PQ Chart in the same course to get an explanation of personal qualities chart). Make This Your Serving Priority! Look forward to Awareness Situation's next newsletter to learn how your Self-Spiritual-Leadership goes together with your Self-Perseverance.